Giant pandas were once widespread in eastern and southern China, reaching into northern Vietnam and Myanmar. Today, the range is restricted to around 5,900 sq. km in six separate mountain ranges in western China, on the eastern edge of the Tibetan plateau. Giant Pandas (Ailuropoda melanoleuca) are about 150cm long from nose to rump, with a 10-15cm tail. A large adult panda can weigh about 100-150kg, with males 10% larger and 20% heavier than females. They are generally solitary, each adult having a well-defined home range, within which they move about regularly. Although they are not territorial, females do not tolerate other females. Giant Pandas have the same digestive system of a carnivore, but they are adapted to a vegetarian diet of bamboo. Bamboo contains very little nutritional value, so pandas must eat 12-38kg every day to meet their energy needs. Broad, flat molar teeth and an enlarged wrist bone that functions as an opposable thumb are physical attributes that help the Giant Panda to hold, crush and eat bamboo. Unlike many other bears the Giant Pandas do not hibernate. They will however, descend to lower elevations during the winter to take shelter in trees and caves. Encounters are rare outside the brief mating season, but Giant Pandas communicate fairly often, mostly through vocalisation and scent marking. Giant pandas reach sexual maturity at around 6 years after which the reproductive rate is about 1 young every 2 years. Pandas normally give birth to a single young (twins seem to be born more frequently in captivity, when artificial insemination is used). A Panda's average life span in the wild is 14-20 years with up to 30 years in captivity. Despite being endangered, a 4-year survey was completed in 2004 and counted 1,600 pandas in the wild, 40% more than were thought to exist, and in areas not previously known. 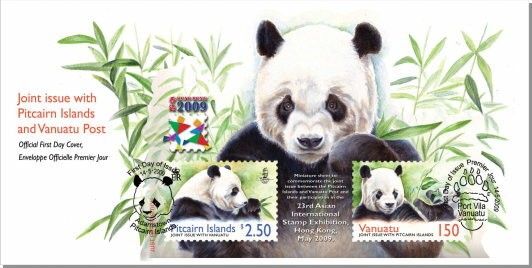 The Postal Administrations of Vanuatu and the Pitcairn Islands recognise the endangered status of the Giant Panda and have chosen this beautiful animal to represent them at the 23rd Asian International Stamp Exhibition in Hong Kong. 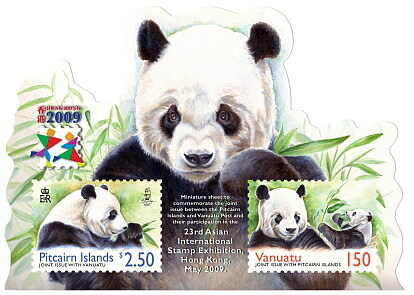 The joint stamp issue in the form of a miniature sheet, has a release date of May 14 2009.